I remember the dusty pink colour of the sky; the sound of my boots crunching on rock and snow. I remember my heavy breathing that I didn’t seem to be able to quieten down; the intense feeling of pain in my fingertips that I hoped would turn to numbness as my body adjusted to the minus thirty degree temperature. It never seemed to do so. And then I don’t remember much, except for the wave of nausea that passed over my body and made me incapable of doing anything at all. I knew I needed to sit down and get this heavy pack away from me, but my fingers were too cold fumbling with the waist strap to set it free. I remember my knees giving in and my eyes going black, just as my sister, Amira, caught up to me and unclipped the heavy load. I slumped to the ground, letting the weight ease from my shoulders when my bag hit the floor. I remember sitting there, just breathing, unable to move, hardly able to speak. My sisters waited patiently, freezing. Then the nausea passed. We started again. It was 5.30 in the morning. We set off hiking in pitch black, minus thirty degrees, at 4,500m of altitude in the Himalayas. We had slept in all our hiking gear, knowing it would be too cold to strip down in the morning. All we did was clean our teeth, try to eat some porridge and drink masala tea, despite the nervous feeling in our bellies as to what we were about to do. Today was the day we were to cross the Thorong La Pass, at 5,460m. Our ten day journey on the Annapurna Circuit so far seemed to have all been leading to this; just one thousand more metres of altitude and four more hours of trekking to get there. It was early March and the temperatures were considerably lower than we had planned for. We’d got to the final stepping stone before the pass with a few troubles and great relief. Muktinath was waiting for us over the mountains. We’d heard rumours of veggie burgers and chips, hot showers, and even electricity in this Emerald City on the other side of the valley. None of us wanted to turn back, and there was only one way over the pass - to walk. As we set off trudging up the steep slope I attempted to control my breathing and block out the pain running through my body. But again, I was met with a nausea I could hardly explain. A nausea made all the more unbearable knowing it was hindering the crossing. I was sure it wasn’t altitude, as we’d only hiked around 100m higher from where we’d slept. It could have been the cold, exhaustion, anxiousness, or perhaps some sort of water or food poisoning. All I could do was sit down, to the utter dismay of my sisters who were healthy and ready to pass to Muktinath today. By this point, fellow hikers we had left camp with were far in the distance. “We’ll have to turn back, we’re too late now”, Anna decided, her older sister wisdom coming through. I knew she was right, but I was heartbroken to have to descend. You’re supposed to cross the pass before 10am or the wind becomes unbearable; we were now an hour or so behind schedule, and if we kept going who’s to say the nausea wouldn’t hit me in two hours where there would be nowhere to escape. As we turned around, the sun crested over the sharp peaks of the mountains; the pale pink sky aglow with richer shades of orange and red, the white of the mountains changing colour accordingly. It was the most beautiful thing I have ever seen. I remember wanting to take a photograph, but my camera was in my backpack and my fingers were numb and incapacitated with the cold. I also remember an overwhelming desire to turn back around and just keep going. And then my stomach growled angrily at me, telling me that my body wasn’t in a fit state to walk today. Would we ever get over this damned pass? Ten days prior to that moment, we were three bright-eyed, blonde-haired sisters beginning our trek on the Annapurna Circuit, a hiking route in the Annapurna Region of Nepal that we had been planning for the last few months. On those first few days, we passed through lowland valleys and villages. Culture was rife, views were vast and green, and we were learning to walk on Nepali terrain, with our heavy rucksacks strapped to our backs, walking poles gripped in our hands, and boots laced on our feet. “Namaste!” people would call as we passed, little children running after us and placing their hands outwards, their little eyes staring up into ours - messy hair and bright smiles - saying the only english word they knew, “sweets?!”. Our trail companion (or angel, as I like to think) was a stray dog we named Alfie. He slept on the doormat outside our room one night and proceeded to follow us for almost the entire trek. One day, as we passed through a town, four possessive dogs attacked him for treading on their land. It was the first time I had on the journey, as I watched him limping off down the trail. He reminded me so much of our own dog, Oslo, in his soft ways, adventurous spirit, and sad eyes. A part of me thinks he was there to guide us along the trail, another part of me knows he was just a stray dog looking for kind companions. Either way, I enjoyed having him skipping along on our heels each day. He was a comforting spirit, at the very least. 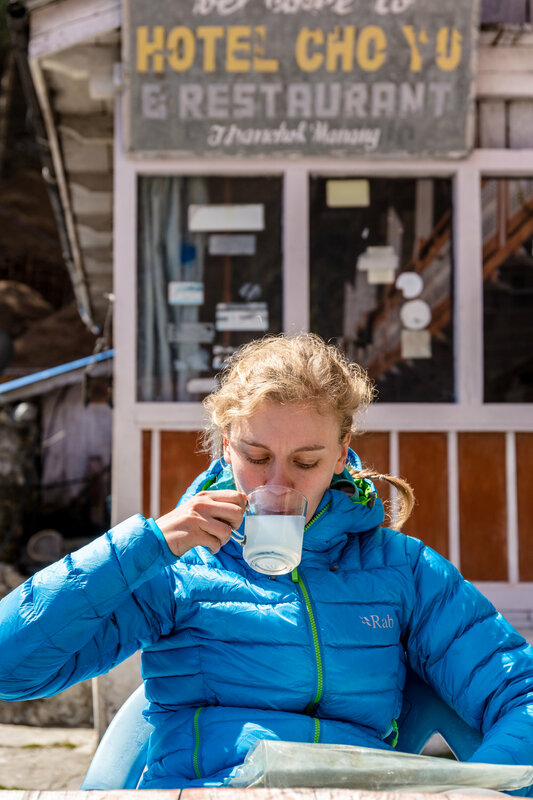 At lunchtime, we would stop in a trailside cafe and eat fried potatoes with vegetables, tibetan bread with honey, and drink lemon tea or chai, before continuing hiking through golden afternoon light. When we got too tired in the evening, we'd find a new teahouse to roll out our sleeping bags in (teahouses are Nepali family-run guesthouses which are dotted along the trail), playing cards, reading books, and writing in our journals until our eyes couldn't stay open any longer, usually at around 8pm. Showers were rare; sometimes we were given a bucket of hot water to stand over and wash ourselves. This was the best kind of shower. Much better than a ‘western shower’ that was ice cold, anyway. In the morning, we would wake up, change into our hiking clothes, eat porridge and drink Nepali tea, before loading our bags onto our backs and continuing on the path. It became a routine so opposed from normal routine. The kind of routine I can see myself following for a long time. Every day we trekked, we made our way higher and higher into the Himalayas. It was a hazy afternoon when we first caught sight of Annapurna II, peaking between pine trees in the forest. Her gentle flanks rising up in a golden sunlit glow, a wisp of cloud seemed to be blowing off the very peak. It was a sight I won’t ever forget. I almost didn’t notice her through the dusty haze of the afternoon, and then I could see her so clearly that my eyes were fixated. Hypnotised. My mum told me I would cry when I first saw Annapurna. She was so moved by the mountain that she named her first child after it. I was overwhelmed by emotion and gladness to be heading deeper into the mountains - my heart was telling me I had to be within them. That night we stayed in a village called Chame, and the next day we trekked amongst blue pine forests with our newly discovered mountain vistas following us the whole way. It was unbelievably breathtaking, and I felt a serene peace in my body. I didn’t imagine Nepal to have forests, so to be walking through one set my eyes on fire with glee. The air was thick with the scent of pine, as we rambled along dusty paths and over gentle slopes to reach Upper Pisang, devouring Daal Bhat and Nepali tea that evening with vast views onto the snowy peaks of the Himalayas. Tomorrow would be our biggest day on the trail so far, and all three of us were nervously aware that we would be heading into higher and more dangerous altitudes. What so far sounds like a once upon a dream of trekking and mountains and forests is not all as fairytale as it seems. We were dirty, hungry, and tired a lot of the time. And of course, being sisters, we bickered a little. Anna had been battling a cold for the past few days, and though she was just about now recovered, she was struggling to keep up with the pace of Amira and I, who were lost in our own world and enjoying every inch of the trail before us. I’m quite accustomed to solo hiking, but I inconsiderately chose to ignore the fact that Anna might not be so keen on a hiking alone on a trip she’d signed up for with her two sisters. The next day would be a long one, and I wondered if Anna would cope. She didn’t like the hills, she didn’t like being out of breath. I didn’t like walking slowly. I’d rather stop and wait at the top. The difference in paces was becoming an issue, and my patience was running out. In hindsight, I was selfish, and I regret not walking with Anna for the whole trek. It was a painful struggle for me to slow down, but as we walked together for the last few miles into Manang - where we would be acclimatising for the next few days - the difference in spirits was huge. We’d walked around nine hours that day, and the evening saw an intense cry and heart to heart between us which made it evident that our attitudes would have to change. I’m mentioning this because it is something you learn from travelling with others. A difference in attitudes, sisterly squabbles, and an impatience on my part almost threatened the whole trip. We settled our differences and took a couple of days enjoying the mountain vistas of Manang, though ever eager to move on. The hike was steep and intense. It was incredibly hot that day and the sun was belting down onto our faces and heads. We had just one bag between the three of us. All the water (around 6 litres) was in there, along with three down jackets, first aid, and snacks. Amira and I took it in turns to carry the bag, glad to be having a break from it and realising how easy it would be if we had porters like so many other people we’d met on the trek. Expansive views looked out onto snowy peaks on the opposite side of the valley. Mountains like I had never seen before, with their deep, jagged edges and looming peaks. At one point, we witnessed a small avalanche across the valley, standing in silence as we realised just how little control we had over the elements, and how deep into the mountains we were. At around 4,500m Amira started to feel unwell. She powered on until her body told her to turn back, insisting Anna and I continue. We went our separate ways. For Anna and I, that final part of the hike seemed to take forever, dragging onwards as I became more and more worried about Amira and regretted letting her go down alone. I should have mentioned that little Alfie, the dog, was still following us. I didn’t know dogs could get to high altitude, but he seemed to be coping better than the rest of us. I was glad to start descending, agreeing to leave Anna on the way down as I power-walked the dusty descent to find Amira. I found her stumbling drunkenly at the bottom, grabbing her arm and cursing myself for letting my little baby sister go down alone. If anything happened to here I would never forgive myself, and neither would my mum. I marched her straight to a teahouse at the bottom, where she was forced to drink as much water as she could and sit in the shade with her head resting on the table. I think she was suffering from a combination of altitude sickness and sunstroke. That evening she lay her little head on my lap and I didn't let her out of my sight until she felt better, checking on her multiple times during the night. It was becoming all the more evident that the three of us had to stay together, it was unquestionable. It took two more days to reach Thorong Phedi, where this story began. Now our hiking paces were all the same, as we had to go slowly to ensure our bodies fully acclimatised, not able to walk more than four hours each day. The temperatures were cold now, and from shorts and t-shirts we were now wrapped up in thermals and down jackets. The lush, blue pine forests of a few days before had been replaced by barren valleys, glacial peaks, and low clouds. It was looming and eery. We were heading into the heart and soul of Annapurna. Crossing the Thorong La Pass, coming to the blog soon.